HOLEY GALAHAD® is a new generation of patented carbide discs with “see through” technology – enabling you to see the workpiece surface behind the disc while you’re working. This feature dramatically improves production by up to 15% and saves using literally hundreds of flap disc sanders. You’ll notice an immediate difference, Holey Galahad® quickly allows you to shape peaks and valleys into smooth surfaces as you see them, eliminating the need to “feel” the high and low spots. You can see what you’re doing and where you’re going as you work as opposed to the standard procedure of carve, lift, check; carve, lift, check, and repeat. 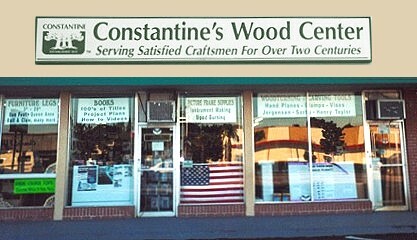 FEATURES: Nothing shapes wood better! From bowls to bears or artistic sculptures to log homes, furniture making, and taxidermy – anytime you need to get a final shape, whether flat or contoured, Holey Galahad® see through discs can help bring your vision to reality. 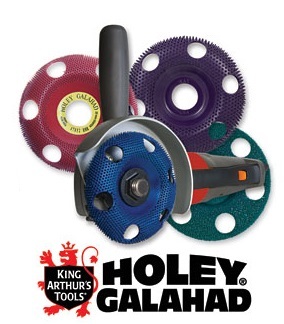 Holey Galahad® features patented carbide teeth that move effortlessly with or against the grain on all types of wood. These extremely sharp, long wearing conical teeth provide superior surface removal with a very smooth action, making Holey Galahad® easy to control. TECHNICAL: Made in USA. Designed to fit most 4-1/2” (115mm) and 5” (125mm) angle grinders worldwide. Maximum 14,000RPM. All discs are 4” (100mm) in diameter with 7/8” (22mm) center holes and feature patented structured tungsten carbide teeth bonded to steel discs over the total cutting surface. Tungsten carbide needles manufactured in a 5-stage patented process. Holey Galahad® discs are also quite effective on fiberglass, plastic, solid rubber, foam core, polyurethane, silicone, soapstone and composite materials used in taxidermy.